Most of us have a hard time getting to sleep. Yet, not getting good quality sleep can lead to significant health problems. According to the National Institute of Health, sleep plays a vital role in good health and well-being throughout your life. Getting enough quality sleep at the right time can help protect your mental health, physical health, quality of life, and safety. 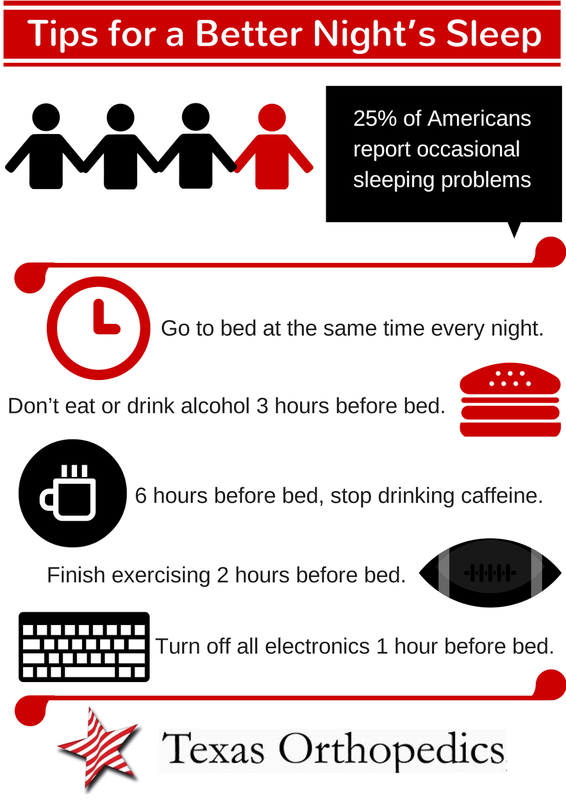 Whether you're a student heading back to school or an adult in search of some Z's, here are some tips to help you get a better night's sleep. 1. Try to go to bed at the same time every night - even on weekends. Variations in your sleep pattern can disrupt your body's sleep-wake clock. 2. Stop drinking caffeine at least 6 hours before bed. Coffee is a stimulant and its effects can last as much as 8 hours! 3. Don't eat or drink alcohol 3 hours before bed. Eating too much or drinking alcohol can worsen the effects of insomnia. 4. Finish exercising at least 2 hours before hitting the sack. Exercise in the mornings to give yourself a nice boost of energy for the day. 5. Turn off all your electronics 1 hour before going to sleep. The light tells your brain that it's time to be awake. 6. Use the hour before bed for quiet time and relaxation instead of working or studying. Keep up with Texas Orthopedics' news by following us on Facebook and Twitter (@TexasOrthopedic).